Refer to the markdown guide if you need help posting anything. My old desktop is currently off, so can't remote into it- working on transitioning everything from it to my Corsair One Pro on Manjaro. Honestly I don't really understand screenfetch. Only usage I find for it is for showing people your desktop and I can do it without listing every unimportant detail about it. But the unimportant details are the fun ones. Especially when you see weird stuff. gbryant ever tried Manjaro Budgie? 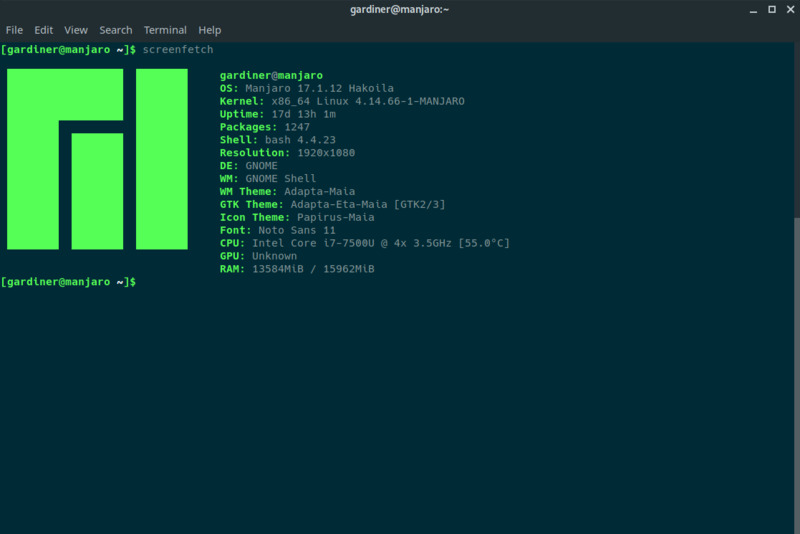 Gardiner, why are you still on Manjaro 17? Running ubuntu on my desktop rn. 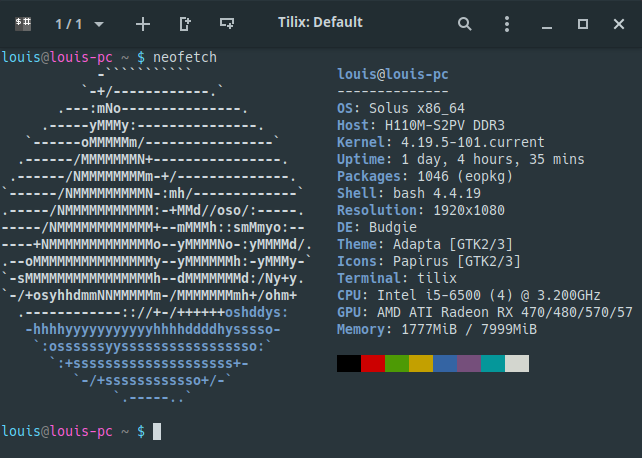 I've been distro-hopping for a while, but I've been pretty happy with Solus lately. Recently made the shift from dual boot to pure Linux, can't say I'm sorry to see Windows go. MariusElvenwood did you enjoy the setup process? s31bz It wasn't as hard this time, because I've installed Arch on this laptop about 3 times now. But every time I do I always have to change the configuration to get xserver, Bumblebee, SDDM and KDE working. 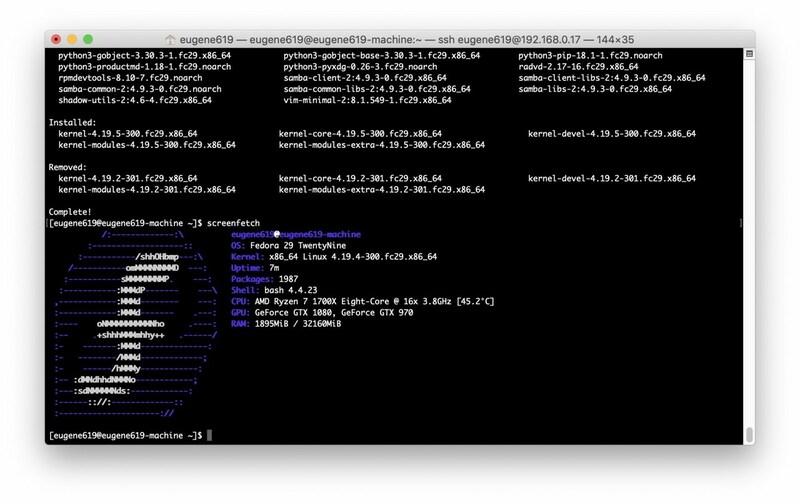 I liked the setup process because it feels like I understand what's running on my laptop more than a GUI installer and I gained more skills that way, but a GUI install would have been quicker and wouldn't have been such a headache to work with. MariusElvenwood Understandable. I only did Manjaro on my desktop, as I needed the setup to be quick so I could begin working immediately. Might try the Arch install on my laptop once I'm finally finished with online college courses. TzZek what is the file browser, ranger or something else? TzZek Really love this colorscheme! Damn @TzZek, you've got one awesome color scheme. I like it a lot. I've got a 9343 XPS. How do you like the 9350? Had to upgrade my mobile workstation so I bought a 9570. Best investment ever. 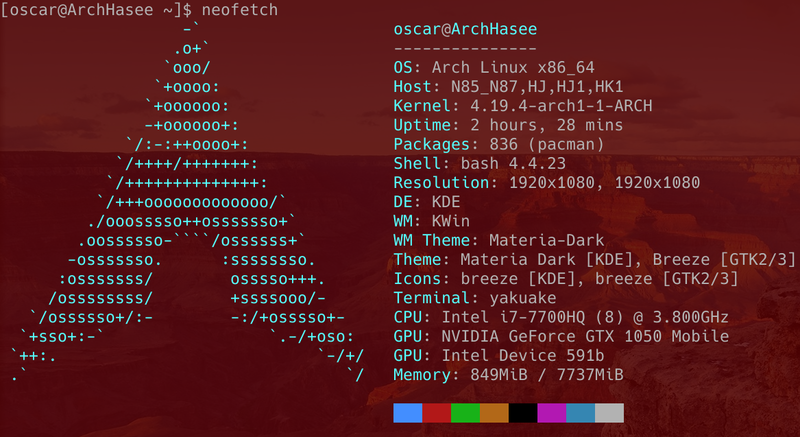 Currently running a Kali VM with the 1070 Ti passed through so I can work with Hashcat more efficiently. Also run a windows VM for the few games that Proton/Lutris can't handle. sgtawesomesauce Its good for what I need it for currently, but for sure haven't put it through anything much. Three for the price of one! 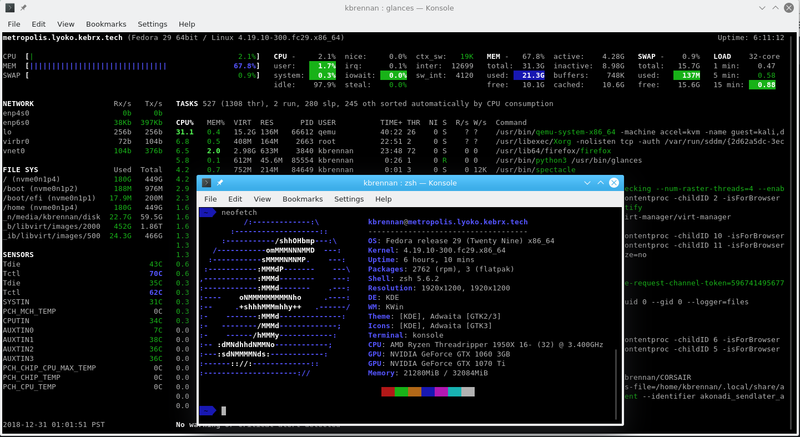 Portable laptop (ThinkPad) runs KDE Neon, main (desktop replacement) laptop runs Ubuntu 18.04, and home server runs Ubuntu Server.